Disney fanatics rejoice! It really will be a bed fit for royalty when your little prince or princess is tucked up tight between sweet Disney Princess sheets. Add a splash of colour and test your little one’s Disney know-how with a whimsy and colourful Organic Disney Princess sheet set gracing their bed. Children can spot 10 different Disney Princesses, including popular favourites Belle, Mulan, Ariel and Snow White. Not only do the sheets look brilliant with head to toe princess characters, the linen itself is of a quality you’d expect from Pottery Barn Kids. A pure organic cotton percale, they provide a perfectly snug fit with no creeping corners – an excellent choice for wriggly little bodies! Sheet sets include a fitted and flat sheet, plus a pillowcase and are available in single size ($109), king single ($119) and double ($129). Extra pillowcases ($19) are also available. 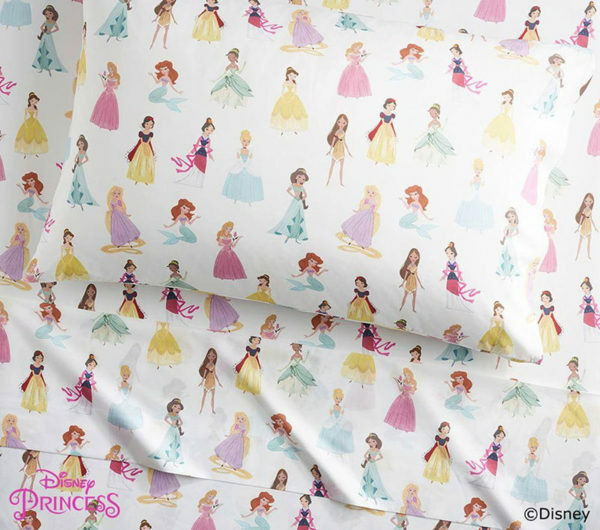 Shop the Disney Princess Sheet Set direct from Pottery Barn Kids.